AgW Silver Tungsten Alloy - Buy AgW Silver Tungsten Alloy, tungsten alloy, Silver Tungsten Alloy Product on Hubei Fotma Machinery Co. Ltd.
1.Silver tungsten alloys, also known as silver tungsten carbides, are used in industrial and domestic circuit breaker applications where good weld and erosion resistance is important. 2.The higher silver grades have higher conductivity, and the higher tungsten grades have greater erosion and weld resistance. 3.High contact pressures are required to ensure effective operation if used for frequent high current switching, and mixed oxides of silver tungsten can be formed to give high contact resistance. 4.Silver tungsten alloy has proven to be an excellent material because of its ability to resist contact "sticking" or welding and also because of its resistance to oxidation. 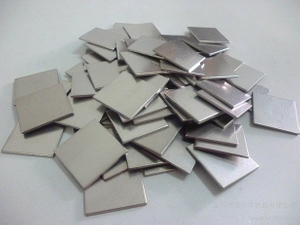 5.We produces AgWC materials ranging from 35% silver and 65% tungsten carbide to 60% silver and 40% tungsten carbide. 6.In some instances, it is advantageous to have a combination of tungsten and tungsten carbide mixed with silver. Silver tungsten alloys contain between 15-70% silver. such as moving contact for circuit-breakers between 100 and 800 A, earth leakage breakers, moving contact for air circuit breaker between 1000 and 10000 A, thermostats, miniature circuit breakers, arcing contact for large size contactors, moulded-case circuit breakers and heavy-load AC/DC contactors, etc.